Some of the experiments and their summaries are shown here graphically for induction of the nose, lens and ear. 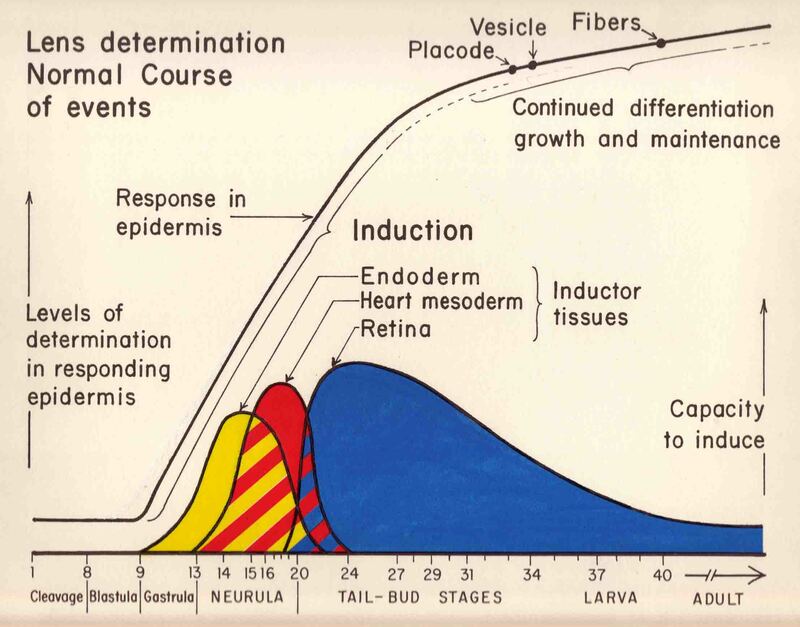 This presentation makes clear what induction has already occurred when the experiment is commenced, and what inductor tissues are seen by the responding tissue during the experiment. 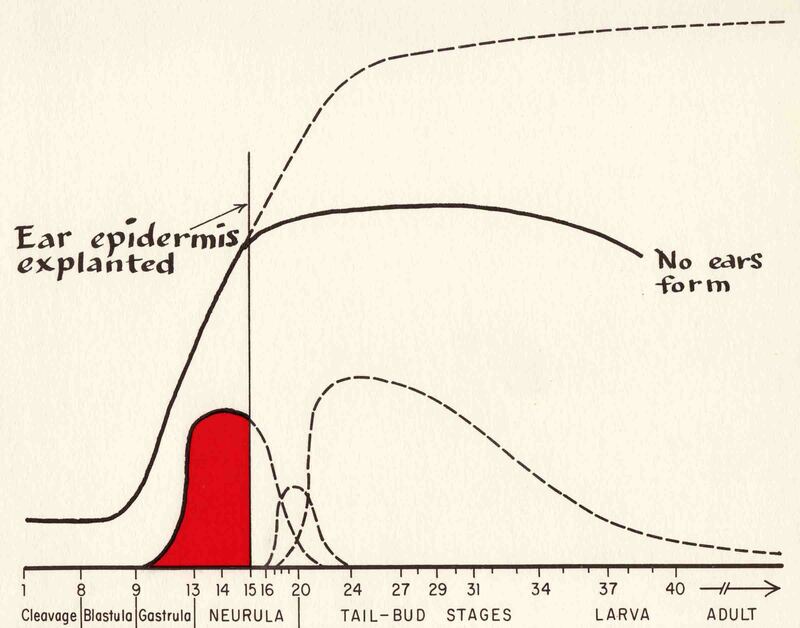 Another section of this website, 'Induction of Lens, Nose, and Ear Placodes' gives an introduction to the topic (see this link). This experiment deprives the nose epidermis of any further induction from anterior endoderm and prechordal plate after stage 16. 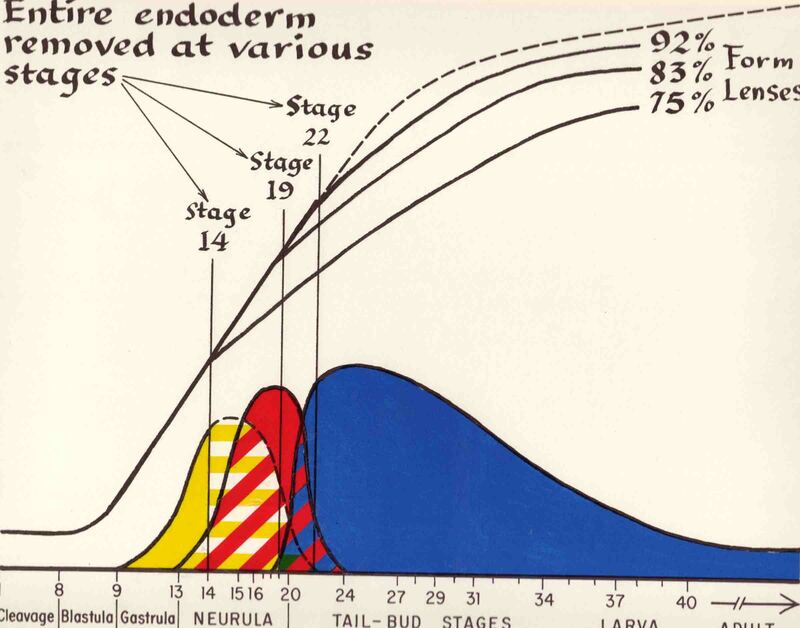 The only difference between this experiment and the one directly above is that the nose epidermis has received induction from the anterior endoderm between stages 16 and 19. 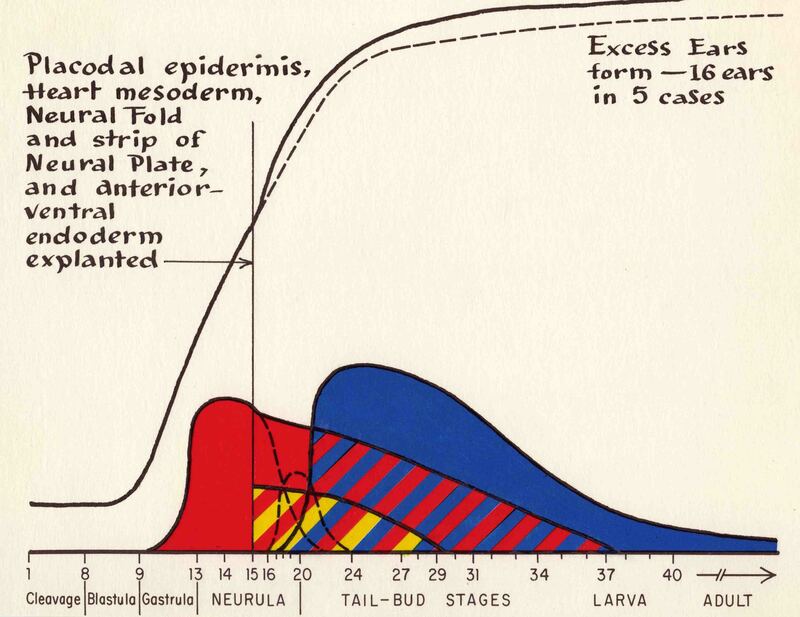 The prechordal plate mesoderm has also made a small contribution of induction. 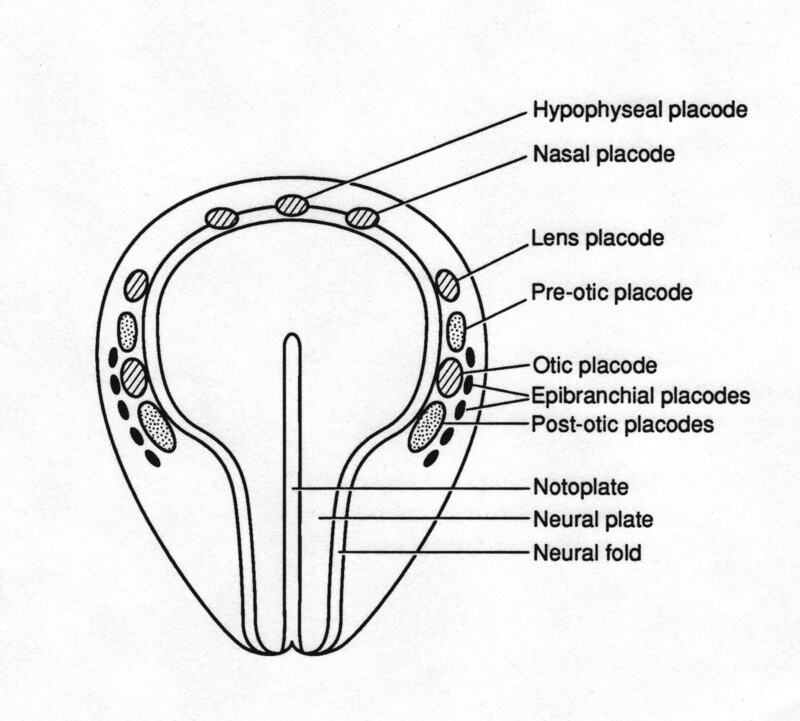 This experiment demonstates the strong nose induction from the anterior neural plate and fold. 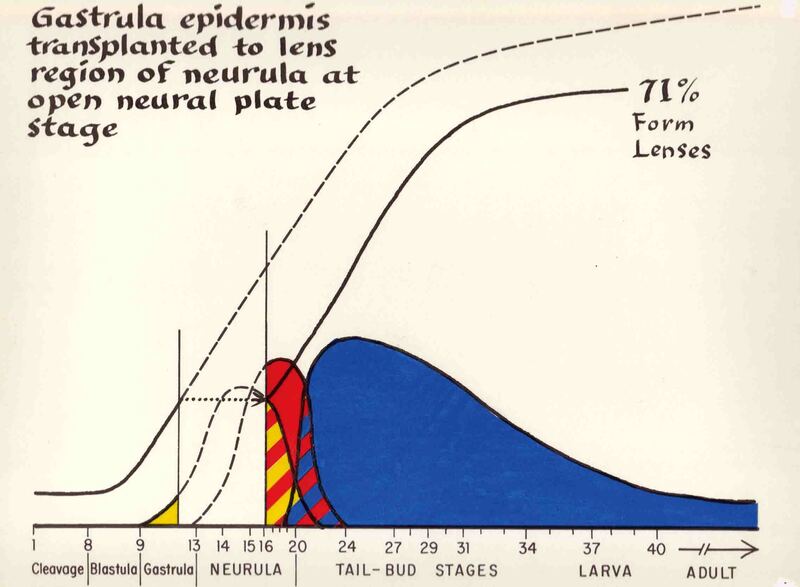 This experiment demonstrates that there has not been enough lens induction by neurula stage 17 to produce any lenses. 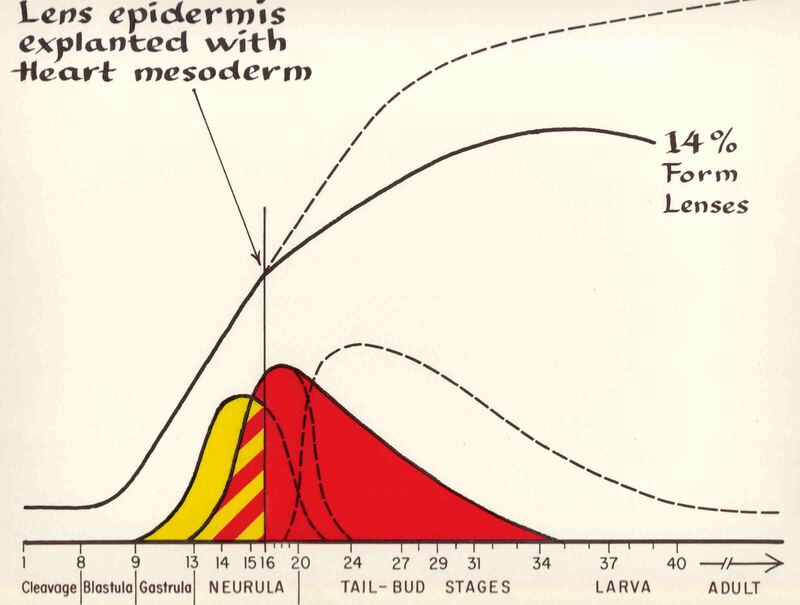 Asssociation with just heart mesoderm after stage 16 is somewhat less effective in evoking lens formation than was pharyngeal endoderm. 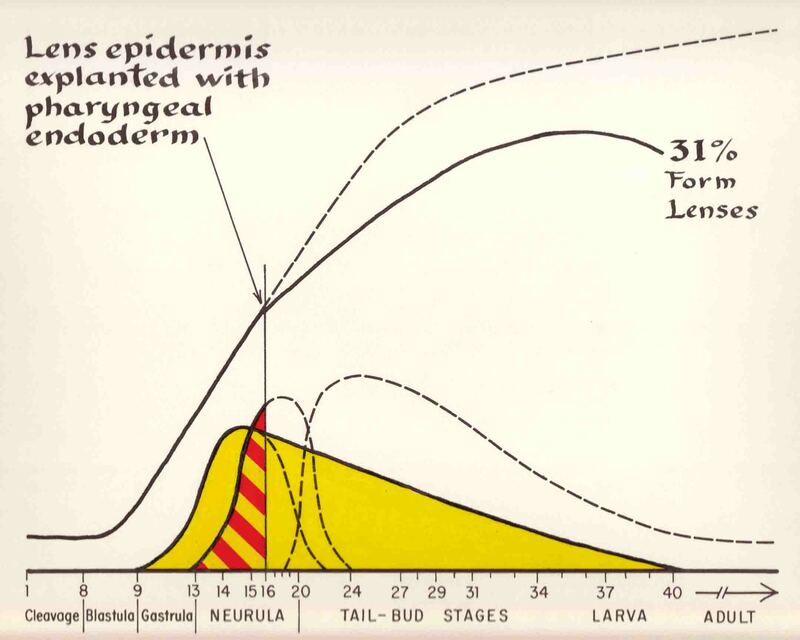 Association with both pharyngeal endoderm and heart mesoderm after stage 16 almost doubles the number of cases that form lenses. 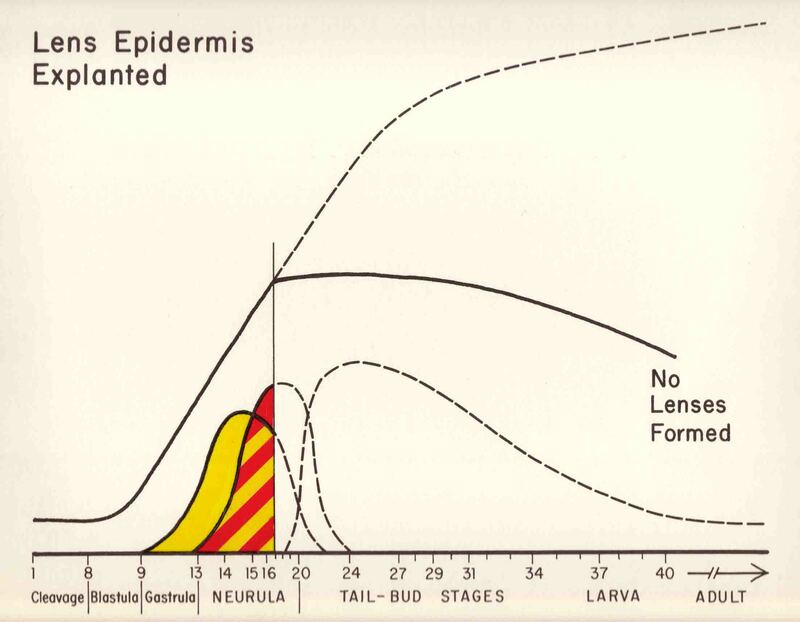 Lens epidermis explanted with retina rudiment produces lens formation in only 3% of cases. 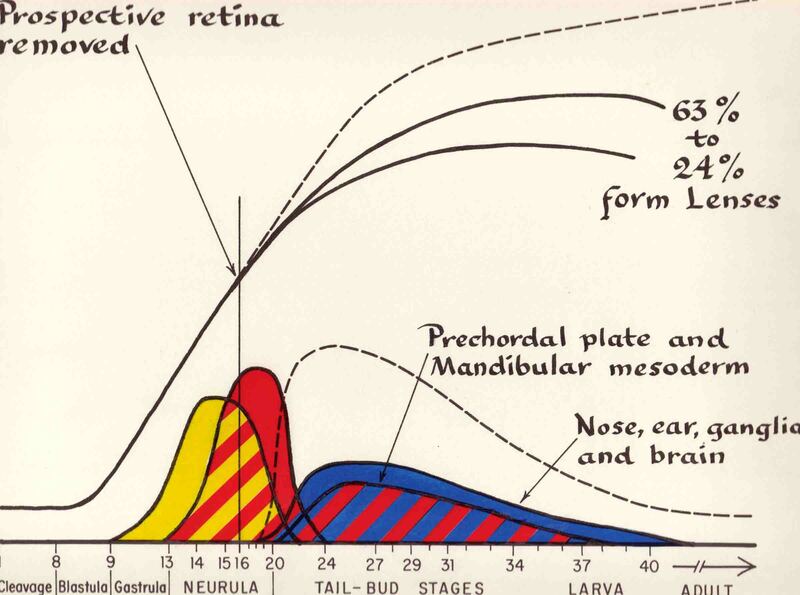 This experiment does not support the older view that the retina rudiment is the principal inductor of the lens. 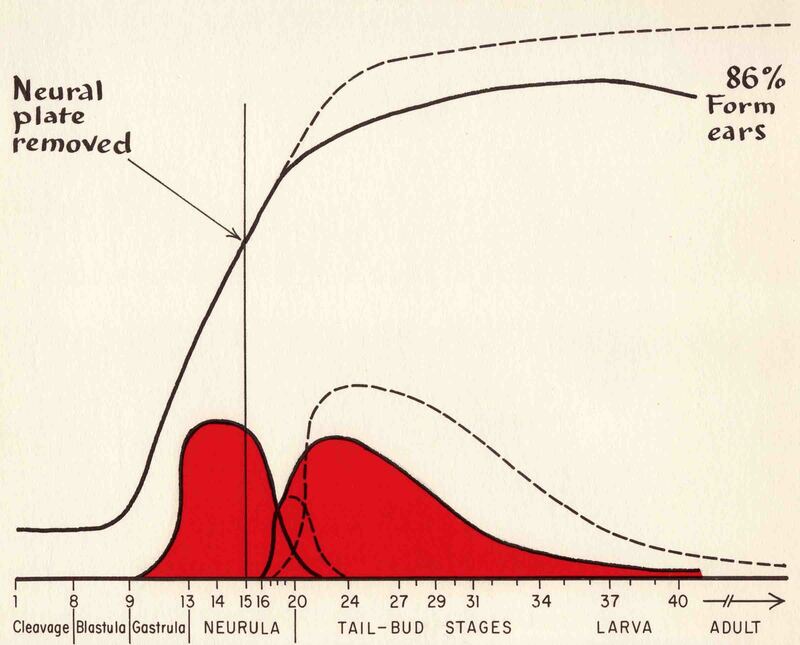 This experiment illustrates the importance of lens induction before stage 16. 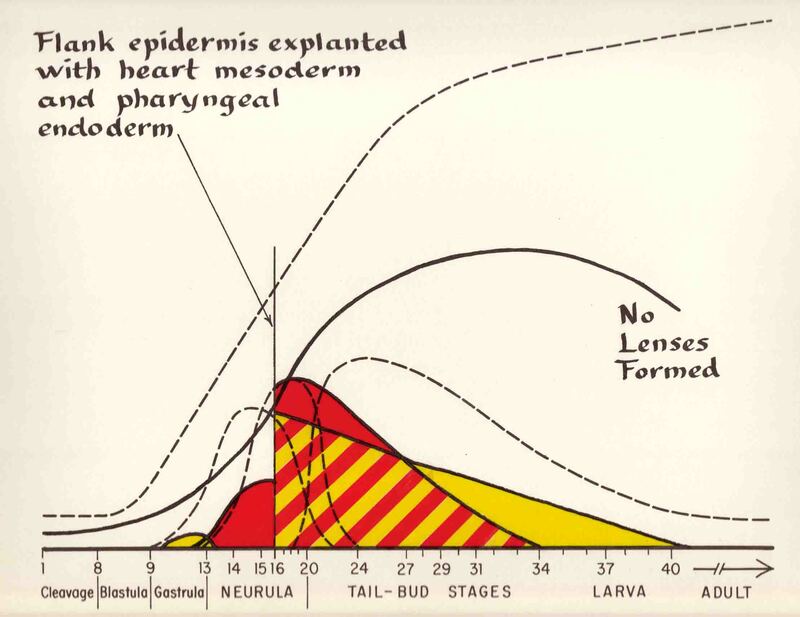 The powerful induction effects of pharyngeal endoderm and heart mesoderm are not sufficient to induce the stage 16 flank epidermis to form any lenses. 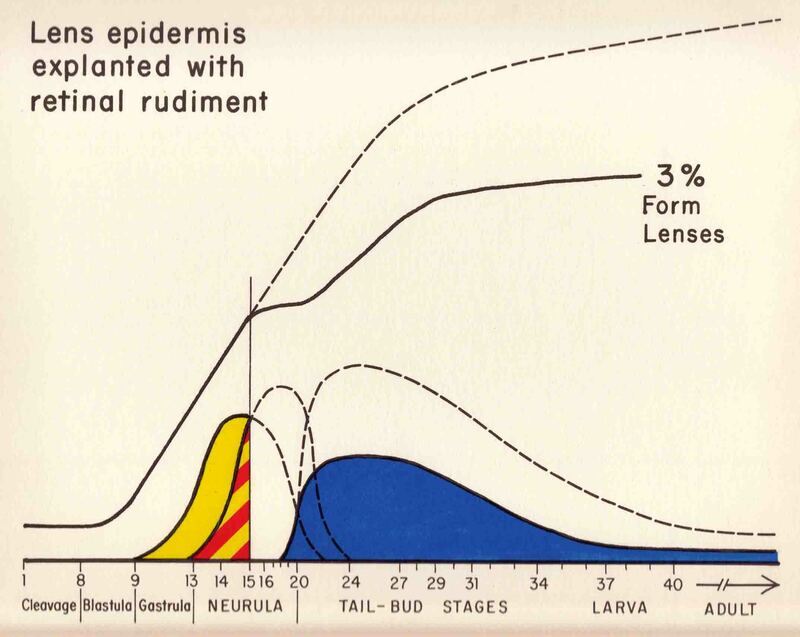 These experiments illustrate the continued induction of lens by the endoderm. This set of experiments together with the next set shown below give a measure of the effects of inductor tissues between stages 15+ and 19. Compare with the experiments directly above. 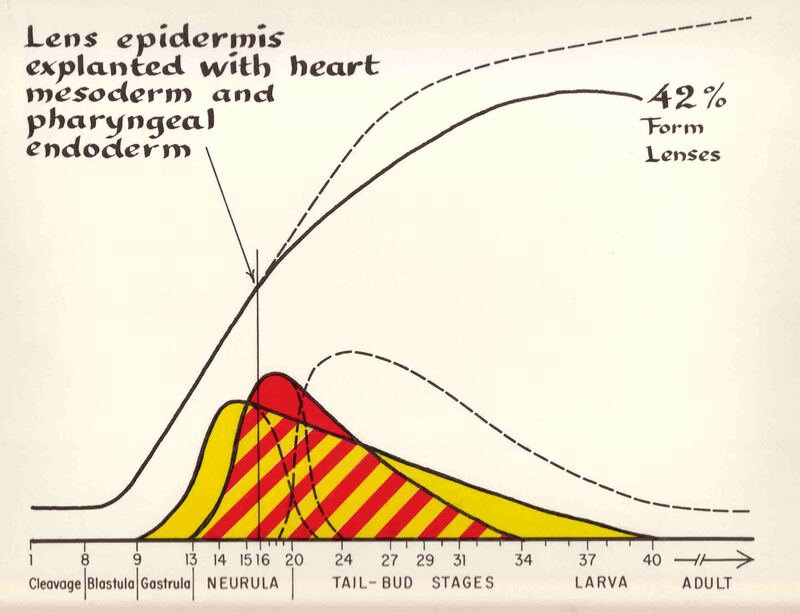 Compared with the experiements above, this set of experiments gives a measure of induction by the early pharyngeal endoderm and the heart mesoderm which is missed in this experiment. These experimentss should also be compared with the set of experiemnts shown directly below. 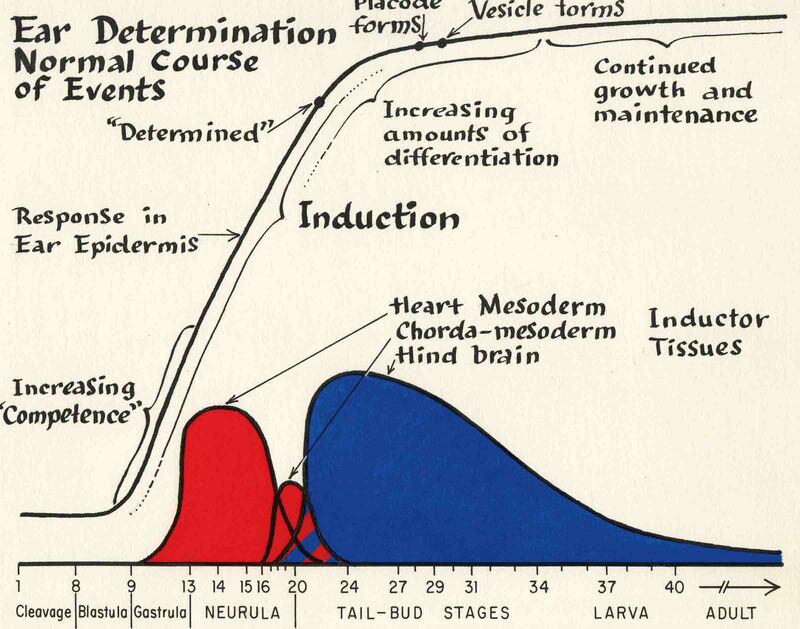 These experiments emphasize the importance of the early inductor tissues. Compare this experiment with the one that follows. These results show it was not lack of a retina in the experiment above that reduced lens formation. 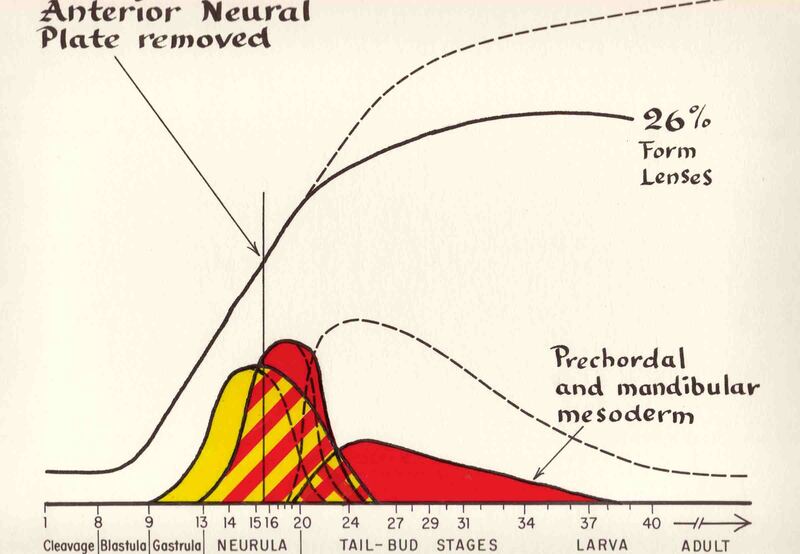 Here the retinal rudiments were removed leaving the rest of the brain, and lens formation was more frequent. 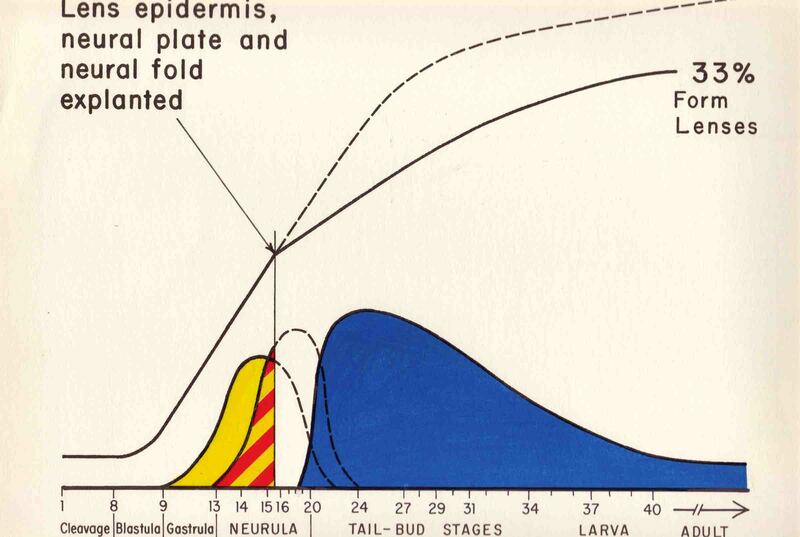 Belly epidermis can be evoked to form lenses if given sufficient lens induction. 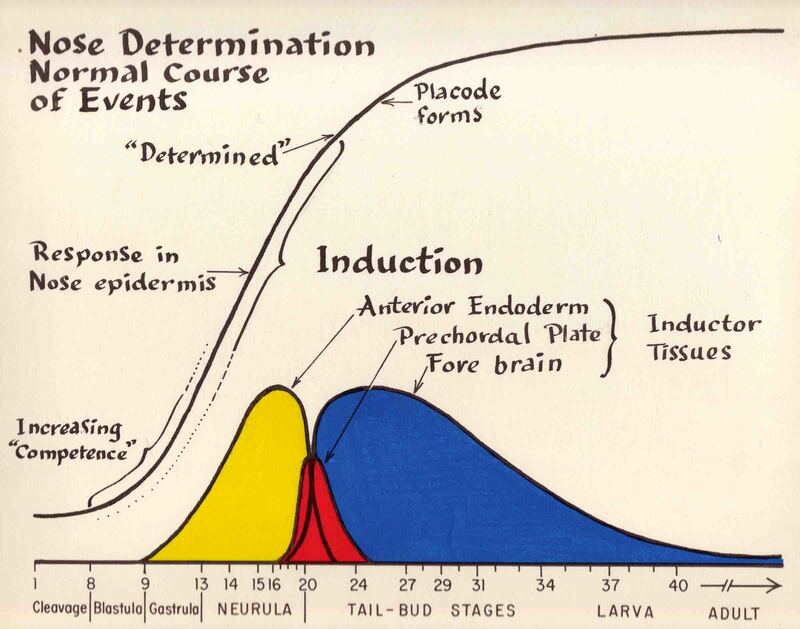 This graph summarizes the normal course of ear induction. 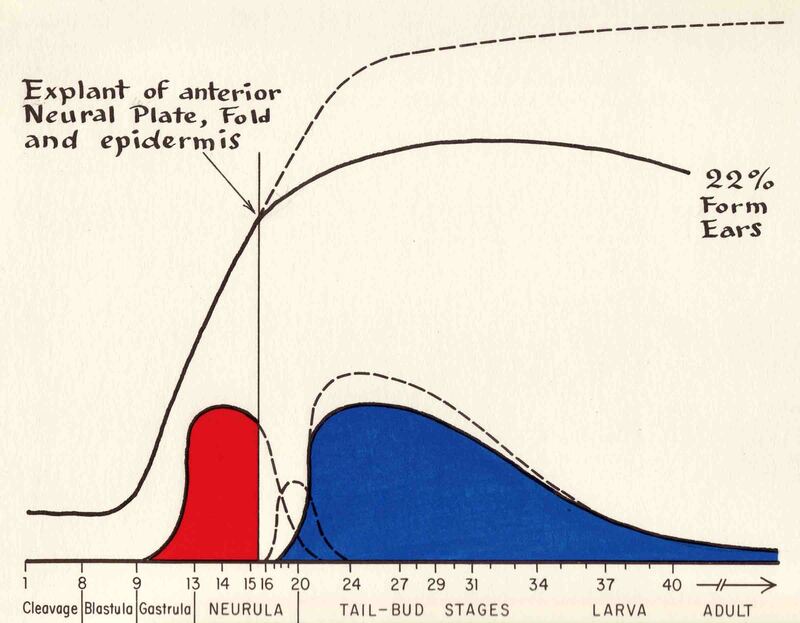 The inductor tissues are in color. By "ear" I refer to the prospective inner ear mechanism. 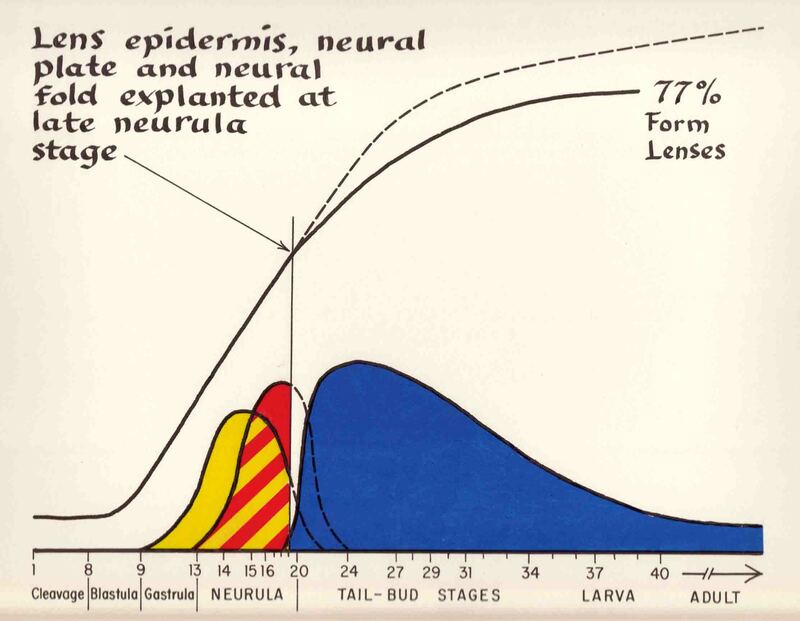 The ear epidermis is explanted by itself at mid-neurula stage 15. No inductor tissues are seen thereafter and no ears form. 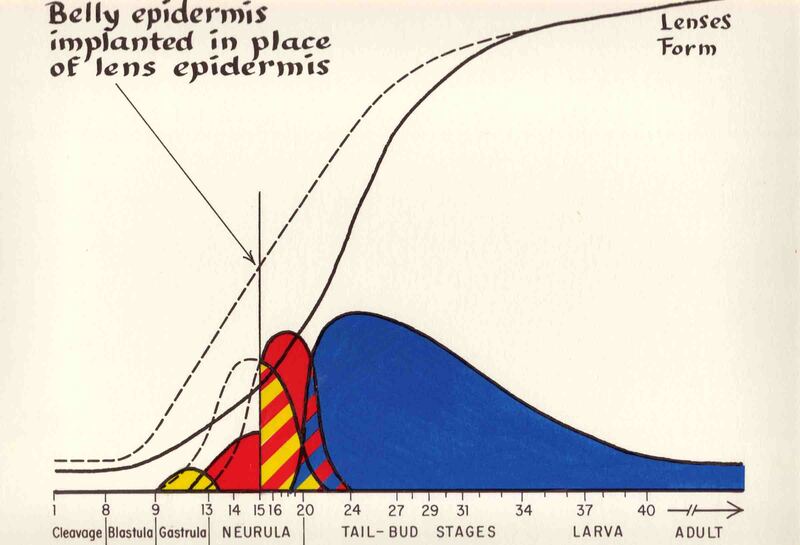 Thus the ear epidermis is not sufficiently induced at stage 15 to form an ear. 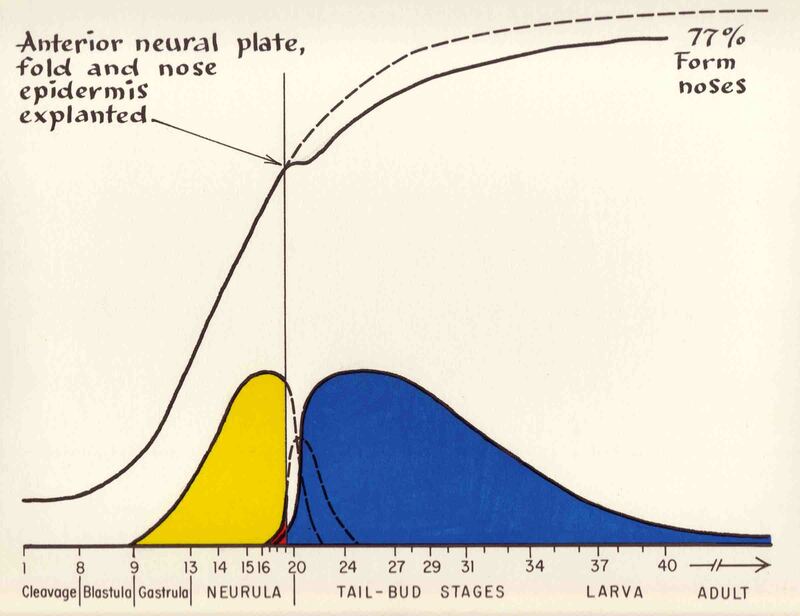 The neural plate is removed at stage 15 so the ear epidermis has no contact with prospective brain thereafter. Instead, the epidermis contacts underlying mesoderm that it does not normally see as the brain forms. 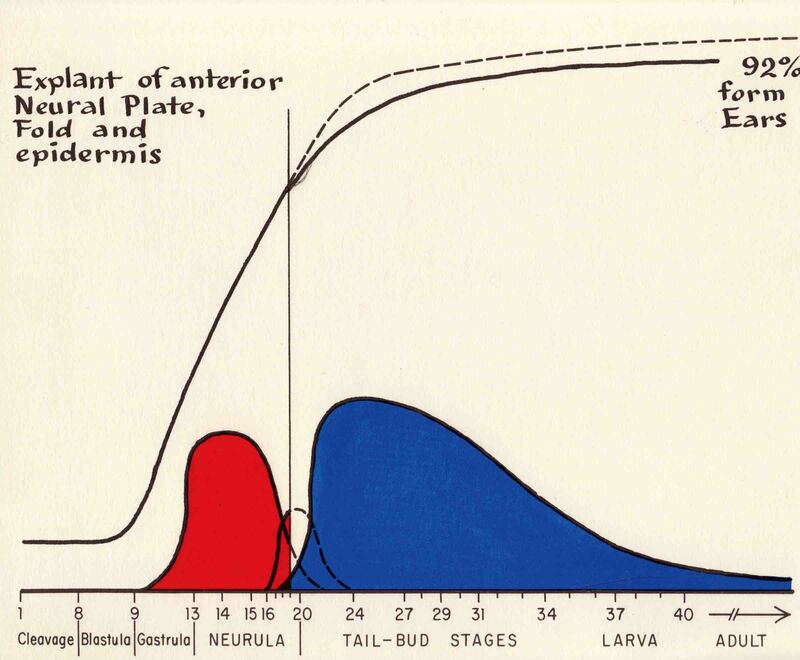 When the prospective ear epidermis is explanted at stage 15 with the anterior neural plate and fold, no mesodrm is seen after stage 15. 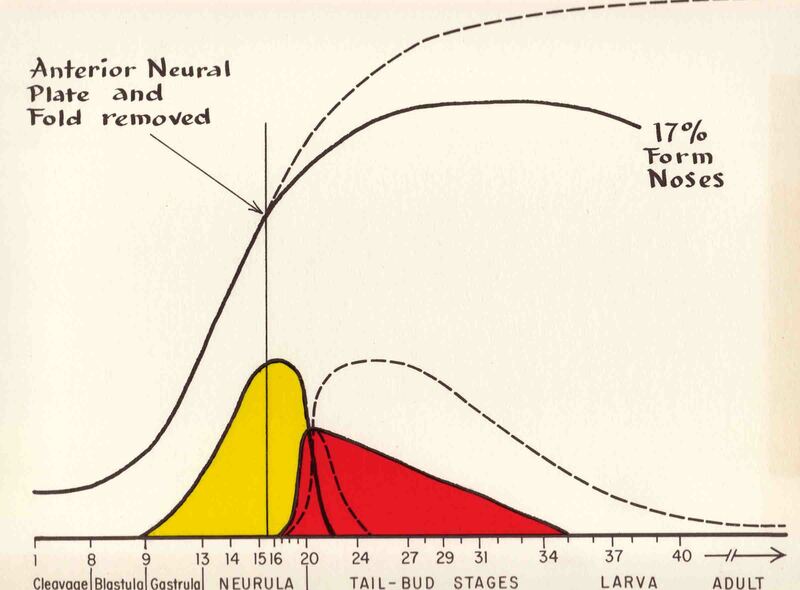 When the same explant as seen before is done at stage 19 (late neurula) as shown here, many more ears form. 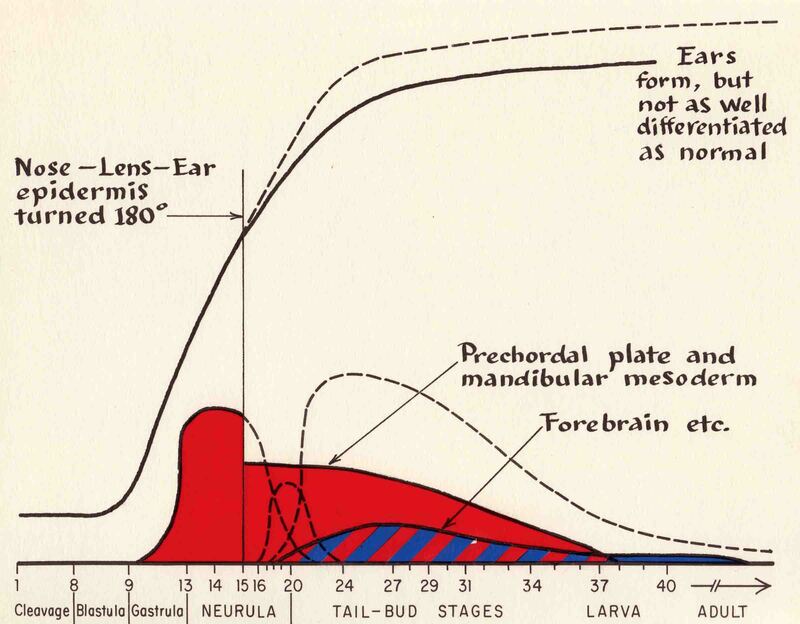 The difference is a measure of ear induction by the normal mesodermal inductors between stages 15 and 19. 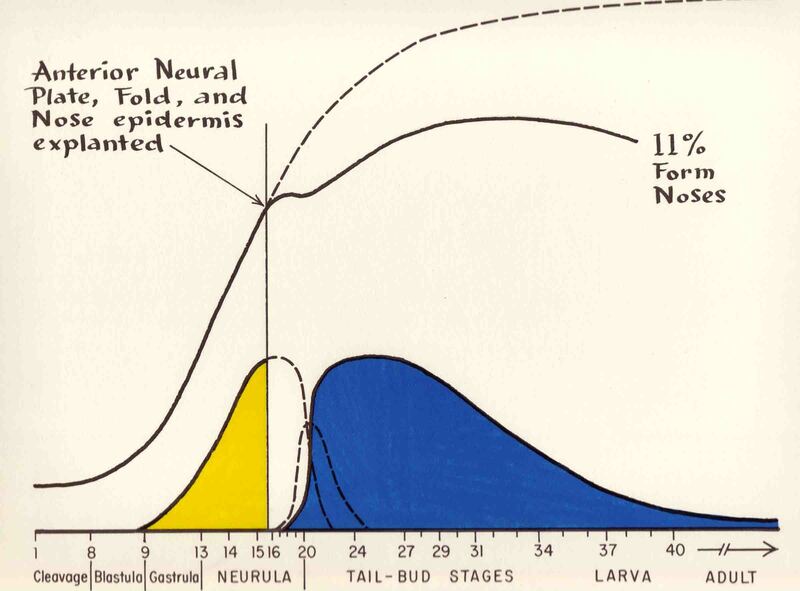 A strip of placodal epidermis, including the two prospective ears, explanted with heart mesoderm, neural fold, and a strip of neural plate plus some ventral endoderm explanted together yields excess ears! 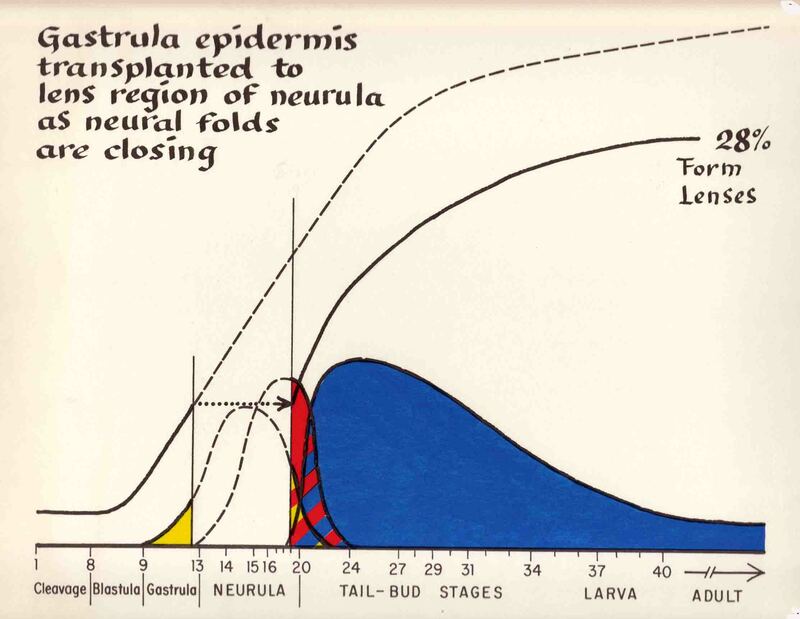 At stage 15, the epidermal strip containing the prospective nose, lens and ear was rotated 180 degrees, placing the prospective ear in the nose region and the prospective nose in the ear region, ears will form from the rotated prospective nose epidermis.